Sunday was Milwaukee's official Trick or Treat day. It is always the Sunday before Oct 31st. The kids, & parents, come between 1pm and 4pm. They will only knock on houses who's porch light is on. So, if you don't want to participate you don't put your porch light on. At 4pm you know you won't be getting any more. It works so well because, the kids are safer in daylight and people who give out sweeties don't have to be worried about answering the door to strangers at night. I always ask the parents if I can take a photo. I particularly like the little ones. I am always a little bit sad when it is over but I have our Vegas trip to look forward to now. We should be heading off to Las Vegas on Thursday, next week. We have a pet sitting service to look after the cats and to give Bubba his "Zoomie Juice". We celebrated our 15th wedding anniversary in August......not bad going for the second time around. Anyway, we got married in Las Vegas and really wanted to go back as a celebration. We couldn't get away in August so decided to go a little later in the year. It should be better anyway as August in Vegas is blooming hot. It was 114F when we got married, which was why the wedding was at night. Well, that and the lights looked fab. In November it should be in the 70s or 80F at most. That is much more comfortable for sight seeing. There are one or two sights to see in Vegas. Sadly it was almost time to go back to the US. Donna was taking me to the airport on Saturday, to stay overnight in an hotel before flying off Sunday morning. Before we left we had a visit from some relatives with a little baby. She is just 11 weeks old. It was just what I needed to take the edge off the day. Out came all the old songs my mum used to sing and that I had sung to mine and to Lauren. "Aye, aye up with your leg." "Whoops a daisy, lost the leg of my drawers." and the rest proved to be just as popular with today's babies as they have always been. This baby was laughing so much. She is at the age where you have to work quite hard to get the smiles but it is so worth it. She had me laughing as much as she was. It certainly cheered my day up and reminded me of Donna's husband, who died young, coming home from work one day when I was visiting ......and calling me everything. He fell in the door, yelling at me and calling me names because whilst he was at work in the office, he had found himself singing "Aye, aye up with your leg and show us your dirty garter." and his work mates had heard & seen him. They gave him a hard time all day. Needless to say, the more he yelled the harder Donna and I laughed until we were helpless. Dear Andy. Never a day goes by without we miss you so much. Anyway, Donna took me to the airport Saturday. Lauren and Glenn came too. I was a bit concerned about the weight of my case. I had bought lots of goodies. They set off home and I suddenly found myself alone in the hotel room and feeling really sad. I got a phone call from Donna to say they got back ok and she suggested that she let Philip know the room number etc and maybe he could phone me. I slept better than last year and didn't fall out of bed this time, which was something of a bonus. The case was not too heavy .....phew! Heathrow airport is magnificent and the time passed quickly. I was soon heading for my favourite seat. A very nice man sat next to me and the flight was uneventful and boring (just as I like them). It was so good to see Philip waiting for me and lovely to cuddle the cats when I got home. Bloody hell is it chilly though. Below freezing every night and the bird bath is already frozen over. Donna's cat, Elsie, enjoys being brushed. By Tuesday my ear was much worse. The whole side of my face hurt, under my chin hurt and it felt as so my whole ear was full up. I knew by now that it wasn't going to go away and was probably an ear infection. So, I had to go to Donna's doctor for antibiotics. My big worry was the flight home. If I didn't get this treated pretty quick it would be a nightmare on the flight. The landing always makes my ears pop and with a poxy ear infection it would be way worse. I felt better after I had been to the doctor and was armed with pills. My friend, Sue, collected me and she took me to Evegate. Here we had coffee, perused the little shops and then had lunch in the pub. Just a baked potato with stilton and mushrooms, but it was very good. Out with Fred again, this time to Hythe. We had some laughs, talking about old times and I felt a bit sad saying good bye to him. In the evening some other friends came round to Donna's. I only see them once a year, but we had such a good time. By now the pills were kicking in and my ear was starting to feel better. Also today, I had a real result. I always love to go to England at this time of year because I stock up on Christmas goodies to bring back. Today I found something I hadn't seen in years and used to love. You may remember them. They are little wafer balls, filled with a sort of cream cheese stuff. I hope they still taste as good as I remember them. If anyone is interested, the only place I found them was Sainsbury's. Now this is what I call a good Sunday roast pub dinner. We went to The Conningbrooke Hotel this time. They have a carvery and, although I don't have the meat, you can help yourself to an array of veggies and tons of gravy (as is quite apparent). I have to admit I hadn't been feeling great over the last few days. I'd had a couple of bouts of vertigo (dizzy, room spinning etc) which I hadn't had for years. I knew it was caused by an ear problem. I really wanted it, to just go away. Pah, how stupid am I.
Saturday - Off to Whitstable. It was meant to be four of us going to visit Peter & Chris in Whitstable. Glenn would have come. In fact, he was coming right up until the last minute. He was due to move but had arranged to do it around this Saturday, keeping this day free for our jaunt. As usual, with Glenn, nothing is ever straightforward. He had taken most of his stuff to the new house share on the Friday. He had then spent the rest of Friday worrying if he was doing the right thing. The woman who's house he was to be sharing had started moving the goal posts. She had increased the rent and now wanted a security deposit that she previously said wasn't necessary. The bed and computer desk which she had promised would be in the room, were not. So, he had been sitting worrying about it. His journey to work, by bike, would also be a lot longer. He phoned that night to say he would either have to spend Saturday buying a bed and trying to get it delivered right away or decide not to move, in which case he would need to get all the stuff he had already taken there, back again. I spoke with him again Saturday morning, when he told me he had decided not to move in with her as this wasn't a good start and did not bode well for the future. His friend, who moved his stuff the day before, would help him get it back. This all ruled out a trip to Whitstable for him. I know he had been looking forward to going too. Donna, Lauren and myself set off. The weather forecast had been awful and the whole thing was almost cancelled. It was only the fact that I didn't have another weekend left that made us chance it. 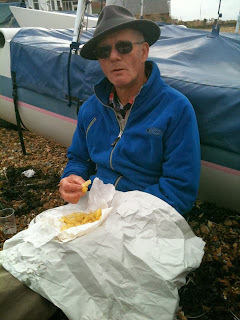 We met up with Peter and Chris, made our way along the high street, stopped for chips at the best fish shop and then ate them on the beach. Back to their house for a cup of tea and slice of delish home made chocolate cake, before making our way home. We all had a fab day out. The above picture is a statue outside Eltham Palace. Thursday my friend, Sue, collected me and we went to Notcutts garden centre near Maidstone. No driving dramas this time. She took me there to see their wonderful Christmas displays. She knows what a Christmas nut I am. It was fab. I bought a few goodies to bring home and then we came back to Ashford and visited Dobbie's garden centre. Their display was not as good this year as last. We had loads to chat about so this is what we did over lunch in Dobbie's. I was glad I decided against the Curry Night as I truly felt worn out by the time I got home. The next day, with very much fear and trepidation (on my part), we set off to Margate. H wanted to show me the Turner Gallery. As you can see in the photo above, the weather was a bit threatening but the rain, surprisingly, did hold off. This was one of the exhibits inside the gallery. I think it was labelled something like - "Conversation" but it could have been called " Weebles wobble but they don't fall down. ", for all the sense it made. The paintings were brill though. I did enjoy the gallery. I was beginning to feel a bit poorly at this time. I thought maybe I was just getting tired as the last few days were hectic. I called off a proposed "Curry Night" for the next day. One reason was that I would be out all day with my friend Sue (also previously of "The factory") and I knew I would be feeling natchered. Secondly, was the fact that no one seemed very interested in going. I have since been told that others had planned on going but hadn't said anything, at least not to me. It amazes me that people can put the fact that they are just 'going to take a bath' or 'eating their dinner' etc, on facebook but can't say they will be attending an event someone is trying to plan. I was told a couple of them who were going, aren't on facebook.....well how did they find out about it then? The only way I knew was that a very kind friend tried to organise it using facebook. As it turned out it was just as well I didn't go. Sunday I had my first Sunday roast pub lunch. It was to be in the Conningbrooke Hotel but we had a last minute change of plans and finished up in the Blacksmith's Arms. It was ok.....not wonderful though. Monday - Donna and I met up with our friend, Paul, for coffee in Ashford town. We met up with him last year at the same place so this is becoming something of an annual tradition. Donna and I then went shopping for her Halloween costume. She and Lauren are going to a party. Tuesday - My friend, H. and her friend, M., came to collect me for an expedition to Eltham Palace....and what an adventure it was. I cannot go into details here but, needless to say it will be a long time before I set foot inside a car with them again. Unbelievable. The picture above is inside Eltham Palace. It is mostly Art Deco (oh I just adore Art Deco), although Henry VIII actually grew up in the older part of the palace. Apparently, some of the Poirots were filmed here and it is often used for tv shows and movies. It was truly beautiful inside. If I could afford to, I would re do my whole house in Art Deco furnishings and decor. I just love the clean lines and the whole uncluttered look. I hate clutter. I was staying at H's that night and in the evening another of our friends came to dinner. We had Thai take away. I had never tried Thai food before and really liked it. We all worked together for years. He looks so much better, stress free and rested, since he too left "The factory". Last year I was poorly during my England visit. Poorly enough that I saw hardly anyone. I was particularly upset at not being able to visit my brother in Essex. People might wonder why he didn't visit me. But, people don't know him. He never wants to go anywhere and so it has always been down to me to go and see him, which I usually do. All his family, wife, 3 kids and 6 grandchildren, live in Essex and we usually end up driving from one place to the next to see them all. It has bothered me since last year that I didn't see him, so I was determined to go this year. I spoke with his daughter and we arranged that, to make it easier on us travelling up from Kent, we would all meet at her house. This way my brother and his family would only have a few minutes drive each. She was so happy and said she would put on a buffet for us. This was arranged a couple of months before hand. So, off we set to Essex. I knew something was wrong as soon as we arrived. She looked so worried when she opened the door. Then she told me. My brother wasn't coming. She said he had phoned her with some excuse about a mix up in the dates and that he had to see his friend. I was so upset. She also told us that he never, ever goes to her house or any of his other kids houses'. The grandchildren never see him. I hadn't seen him in two years, I had made a special effort, not only to get there, but to make his side of the arrangement as easy on him as possible - and he wasn't coming. My sister in law turned up, the two sons and the grandchildren also......but not him. His wife (obviously my sister in law) tried to make lame excuses but Donna wasn't having any of it. "He only sees his friend once a month"
Donna then said, "Oh how often does he see his sister?". "He only has one friend"
Donna, "Oh how many sisters does he have?" My niece and nephews were furious with him, but we still had a good time and tried not to let it spoil the day. One of my nephews brought his virtual reality thingie game with him and we all had a lot of laughs riding virtual roller coasters etc. One of my nephews plays guitar and helped Lauren tune hers, which she had taken along with her. It was like the end of something. There is only myself and my brother left. Now I felt like I was on my own. I doubt I will see him again, for certainly, I will not try that little escapade again and anyway if I did, he would probably be washing his hair or something. We have never, ever had words or fallen out. I suppose he is just becoming a recluse and doesn't want anything to do with his family. Not even his children it would seem. Wednesday we set off to find Lauren a guitar. She has been taking guitar lessons and the teacher suggested it was time she got one of her own. A very dear friend of mine, who used to be head of music in an establishment I worked in for many years, kindly offered to come with us to help us make a good choice. We didn't want anything too expensive just yet. We visited 3 music shops in the town and he made notes and asked all the right questions in each one. I would not have a clue about what makes a fairly decent guitar for a beginner. I would have gone for the prettiest one. Glenn came too and we had a nice little outing. After comparing all the pros and cons we settled on a guitar, amp, tuner, strap & case, which came as a set in one of the shops. But, instead of buying it in the shop we found it all online for 60 pounds less. I would have liked to support a local business but to be honest, 60 pounds is a lot of money so we went with the online option. She was so happy with it all. I bought it for her. I am pleased to help her with something she is so keen on. My magnet is working well. Don't the spider webs on the garden chairs look spooky? Off to town on the bus. As I walked towards the back of the bus I passed a couple on one side and a guy on the other who was leaning over talking to them. I just assumed they were friends and sat behind them. I was soon very glad this couple were on the bus otherwise it would have been me he was talking to. The guy was sounding off about how he hadn't been given his meds and he needed them. If he did something to himself, who would be 'reliable'. His girlfriend ( they always manage to have a girlfriend) was coming round that night but he was going to be playing a football manager game on his play station. He had a problem understanding it as he can't read but eventually figured it out. He then pointed to a little corner shop. "See that shop there? Well my friend went in there and asked if I am allowed back in. The man said 'Not until he has paid what he owes'. So, if that is his attitude I am going to the shop down the road. It is cheaper in there anyway." He then opened the window. "If I don't get any air I can't breathe. I bring deodorant spray with me on the bus because someone farted once and it was terrible. My friend looks after me when I have a bad back. I want to find out if he can be paid as my carer. I need a van. I don't drive so I need to find someone who will hire a van using their own money, do the job for me and then I can pay them back weekly." I wonder what the shopkeeper would have to say about that. I didn't do much today. Donna and I went shopping so I could get some vegetarian food. I love it. I have so much choice in the shops in England. The variety is so much better. The weather is being kind to me so far. It is warm and sunny. Tomorrow I am going to venture into town on the bus. The man next to me, after trying and failing to get me to switch seats with him, (he wanted the aisle, I had booked the aisle as I wanted the aisle), eventually gave up and moved to an empty aisle seat. I don't know where he was from but he obviously thought he could bully me into changing seats. I was having none of it. The result was that I had an empty seat next to me, which was brill. It allowed me to stretch out a bit. Waiting for me at the airport was Donna and the young lady above. Could this be my lickle, wickly baby Lauren? Yes it was and she looked lovely. That hair didn't stay like that for long as it was driving her nuts falling over her face. It was soon tied back and she went back to looking 14 again. I had a short sleep when I got back to Donna's but was still very tired. Glenn was there too. It was lovely to see him.........he still makes us laugh so much.